Well, I should have posted this a couple of weeks ago, but conference organizing takes its toll apparently. I came down with a cold a few days before our conference at Ohio State (May 5-7) and I’ve been struggling with it ever since. The conference, The King James Bible and its Cultural Afterlife, was a great success, though, and all the participants I’ve heard from (we had about 150) enjoyed themselves and the lively exchange of ideas. We had eminent literary scholars from across the world: New Zealand, Belgium, Taiwan, England, Scotland, and across the United States. Universities represented included Oxford, Glasgow, Leuven, Victoria University of Wellington (New Zealand), Yale, Georgetown, William and Mary, Maryland, Purdue, Rutgers, and many more. David Norton (author of The King James Bible: A Short History from Tyndale to Today) gave the keynote address, which focused on biblical language and allusions in Jane Eyre. The plenary panels offered superb papers by scholars of the Reformation, African American literature, English Romanticism, Milton, Gay and Lesbian Studies, and biblical scholarship. Many of the presenters–Stephen Prickett, Jason Rosenblatt, Adam Potkay, Gergely Juhasz, Katherine Bassard, Heather Walton, Michael Wheeler–were contibutors to The King James Bible after 400 Years, but they were joined by Gordon Campbell (Bible: The Story of the King James Bible, 1611-2011), David Jasper (The Sacred Body: Asceticism in Literature, Religion, Art, and Culture), Leland Ryken (The Legacy of the King James Bible), and many others. These books were on display outside the conference theater, along with the book for the Folger-Bodleian exhibitions, Manifold Greatness, a copy sent to us hot off the press. Another feature of the conference was a reading and talk by Pulitzer Prize winning author, Edward P. Jones. 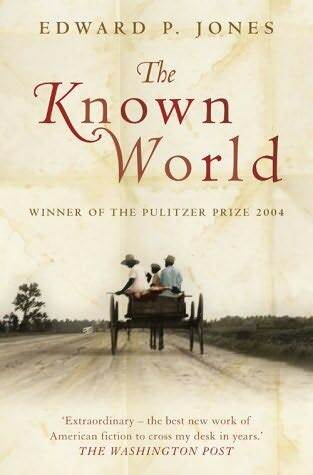 He read passages from his novel The Known World as well as his short story collections about characters in Washington, DC, all chosen to highlight the influence of the King James Bible. He spoke afterward of how the minimalism of the Old Testament narrative had shaped his own style, avoiding unnecessary adjectives and adverbs and minimizing authorial intrusions. 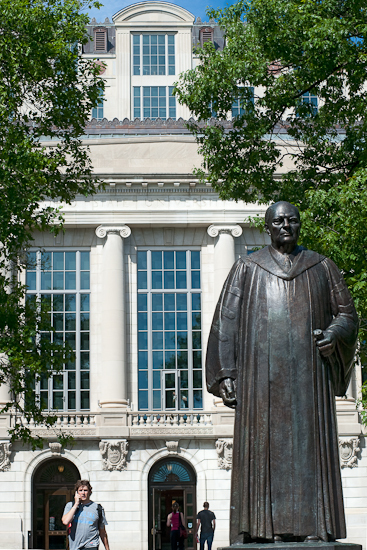 Not only was the discussion outstanding over the several days, but the weather weirdly cooperated with us, giving us the only sunshine Columbus had seen for many weeks. 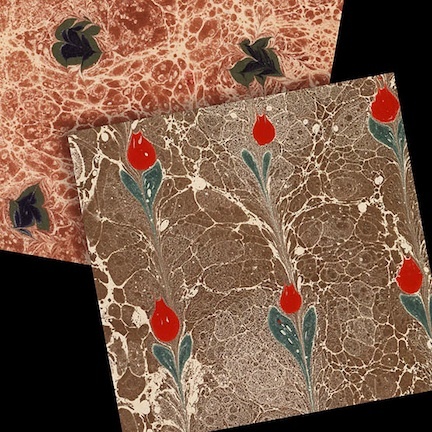 Folger flowers: Papers from the Lada-Mocarski Decorated Paper Collection, Folger Shakespeare Library. If you follow Manifold Greatness on our Twitter account and our Facebook page, you already know that the celebration of the King James Bible this 400th anniversary year has taken some creative turns, in everything from drama, music, and art to crafts as ephemeral as flower arranging and scarecrow making. A quick round-up of some recent highlights reveals—in the last week alone—two new, live-theater productions based on the King James Bible, both in Oxford. A one-night performance at Merton College, University of Oxford, The Full 1611, used lines from every book of the KJB to fashion a 100-minute drama. An Oxford theater troupe, meanwhile, is staging Tales of King James, an original two-actor play, in St. Barnabas Church. On Wednesday, the King James Bible Trust announced the winning new choral works for its King James Bible Composition Awards, out of eight finalist pieces—both to be aired June 19 on BBC Radio 3’s The Choir: “Out of the South Cometh the Whirlwind,” by Zachary Wadsworth and “The Mystery of Christ,” by Christopher Totney. And, as mentioned, some local crafts are responding to the anniversaryas well. A flower festival in Belfast this weekend marks the anniversary with floral displays evoking Bible verses. Nor is this the only KJB flower arranging this weekend alone; there’s another in Stoke Row. Last week’s Eastwood & Kimberley Advertiser even reported that this year’s scarecrow festival in Underwood included “biblical characters” made by residents “to mark the King James Bible’s 400th anniversary,” although a non-KJB George and the Dragon won the contest. You can see the slingshot-wielding David scarecrow here. Another Bible owned by Bob Marley is pictured above and below. 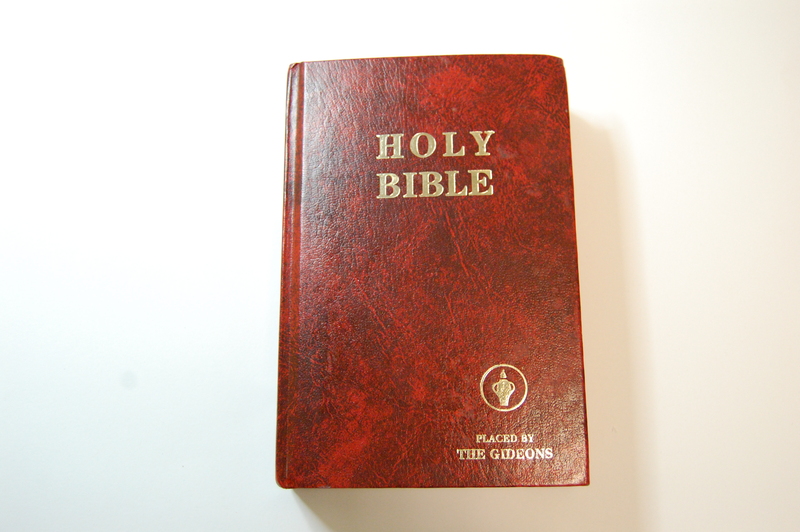 It’s a Gideon’s Bible—a special copy among the many millions of others that have been placed in hotel rooms all over the world. 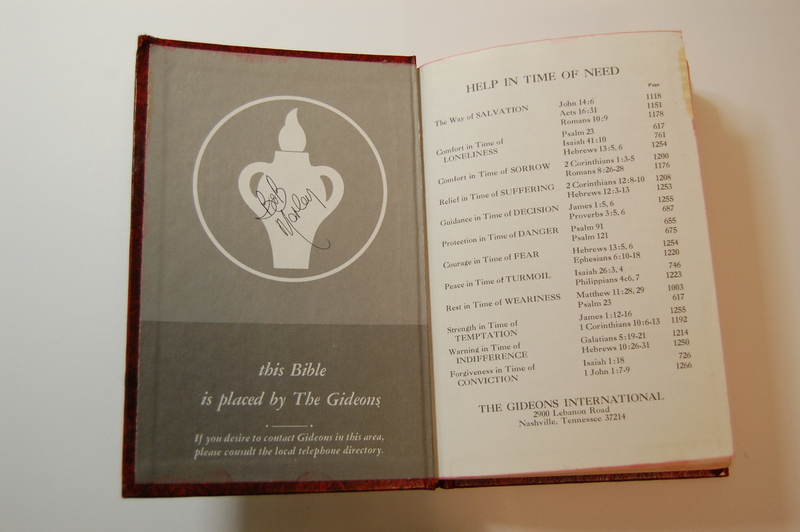 A Gideon's Bible owned by Bob Marley. Collection of the Bob Marley Foundation. Courtesy of the Rock and Roll Hall of Fame. 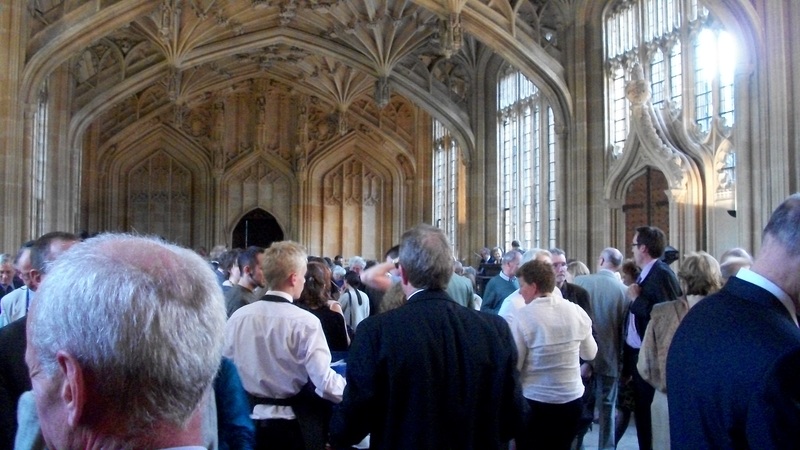 This past Friday, Folger Librarian Steve Enniss and I had the pleasure of traveling to Oxford to attend a reception celebrating the opening of the Bodleian Library’s exhibition “Manifold Greatness: Oxford and the Making of the King James Bible.” Guests gathered in Oxford’s majestic Divinity School for drinks, fellowship, and remarks from Bodley’s Librarian, Sarah Thomas, and comedian Ian Hislop, who was delightfully irreverent. Prior to the reception, I made my way through the exhibition. I was awestruck by the assembled artifacts. 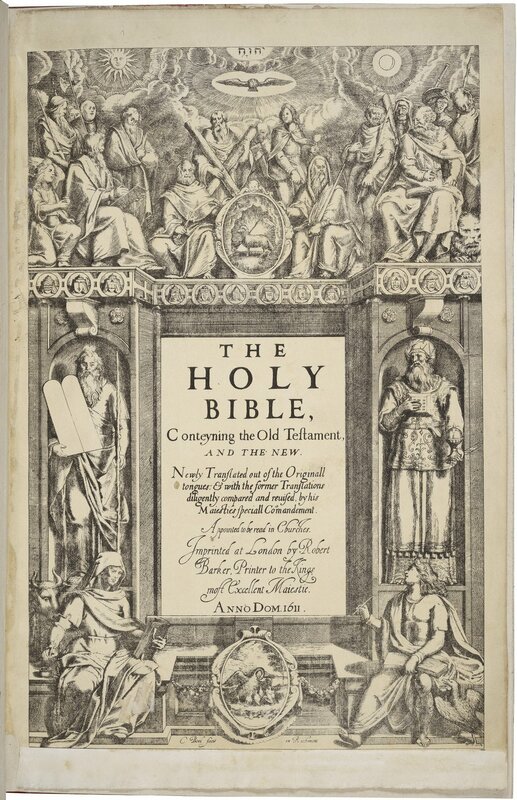 I lingered over Anne Boleyn’s copy of the Tyndale New Testament and the Wicked Bible of 1631, with its infamous typo “Thou shalt commit adultery.” At one point I overheard someone whisper, “Have you seen the Big Three?” The “Big Three” to which she was referring are a copy of the 1602 Bishops’ Bible annotated by KJB translators, a manuscript containing working translations of the New Testament epistles, and surviving notes from translator John Bois. “The Big Three” is a fitting title. On exhibition together for the first time, these three artifacts are primary documents recording the process behind the creation of the King James Bible. 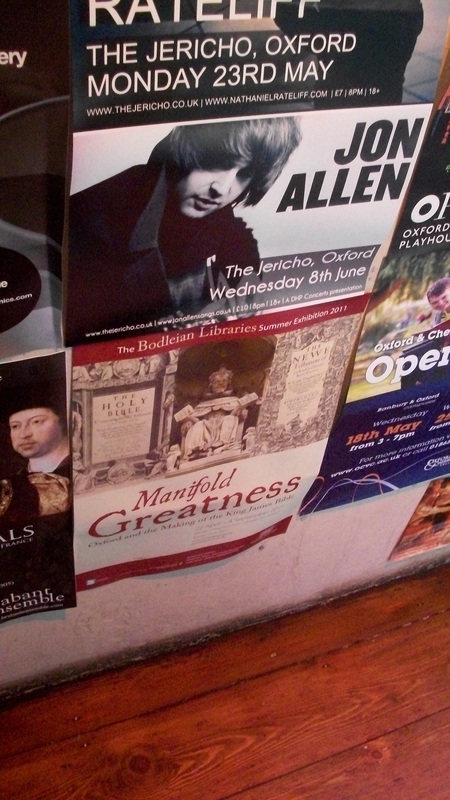 The next day as we discussed the exhibition at the Turf Tavern, Steve noticed an ad for Manifold Greatness hung at the bottom of the tavern’s crowded wall of posters. I thought snapping a picture was in order. We return invigorated and excited to continue work on the Folger exhibition coming this fall. 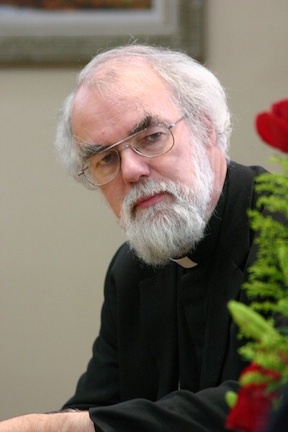 Less than two weeks ago, he was being watched around the world during the royal wedding, but just recently Rowan Williams, Archbishop of Canterbury, has been on a four-day visit to the Oxford diocese—ending yesterday at the Manifold Greatness exhibition at the Bodleian Library. We’ve been following along on Twitter (@lambethpalace) and his website, www.archbishopofcanterbury.com, and looking forward to the exhibition visit! The Bodleian stop included a 33-minute question and answer with Oxford students that is already available online. On his website, you can find an account of the entire four-day visit to the diocese, which includes plenty of audio clips. Scroll to the very end for info on the Manifold Greatness visit. Or, go right to an audio-only page with the full Q & A. Questions include the consequences of having different translations, the difference between hearing and seeing biblical text, and more. The audio begins with about five minutes of remarks by the archbishop before the first question. UPDATE: Learn more about the archbishop’s visit and the question and answer session from this Bodleian Library announcement, which includes photos. This post first appeared on the Folger Education blog, “Making a Scene” and I thought I would share it here. It is Teacher Appreciation Week, after all, and Manifold Greatness has many rich resources that teachers can benefit from. Just as William Shakespeare’s life and work attract myths and speculation, the King James Bible has been privy to a number of legends and half-truths in its 400-year history. And like the works of Shakespeare, the King James Bible has had a profound influence on English-speaking peoples across the globe. The creation and influence of this remarkable book is the topic of a new exhibition and website, Manifold Greatness: The Creation and Afterlife of the King James Bible, recently launched by the Folger Shakespeare Library, Bodleian Libraries at the University of Oxford, and the Harry Ransom Center at the University of Texas. The Manifold Greatness website offers rich resources for educators, including content designed specifically for elementary and middle school audiences. Students can explore key questions surrounding the King James Bible, including what Bibles were used previously, how translators worked together to create the King James Bible, and how this remarkable text continues to be a part of our daily culture. Explore interactive content to get activity ideas for your classroom. The “how to” videos, including the one above, show you and your students how to make ink, quill pens, quartos, and other materials that relate to life during the period the King James Bible was being produced. For older students, you might visit the “Literary Influences” timeline to see how language from the King James Bible has impacted subsequent works, including the poetry of Emily Dickinson and the novels Jane Eyre, The Grapes of Wrath, and Song of Solomon. Curious about a few myths associated with the King James Bible? 1. The King James Bible was not the first translation of the Bible into English. 2. King James did not personally translate any part of the text. Amy Arden is a Communications Associate at Folger Shakespeare Library and developed the Manifold Greatness Family Guide and online content for children. ‘Manifold Greatness: Oxford and the Making of the King James Bible‘ opened, appropriately enough, on Good Friday, April 22, and welcomed nearly a thousand visitors across the Easter weekend. The week before the opening was in many ways revelatory, as the books were arranged in the cases, the loaned items arrived, and the panels were set in place. It was inspiring to see the exhibition taking shape before our eyes, as real books took the place of sketches, and the ‘conversation’ that we had envisaged between the different items in each case began to take shape. It was also humbling: this exhibition is the first time that some of these books have been reunited in one room since they were used by the King James translators. It was remarkable to see the panel designs becoming a physical reality. The team has for the first time used banners as part of the room design for this exhibition: two huge banners hung at opposite ends of one wall feature the Old and New Testament title pages of the 1611 King James Bible. Between them is a portrait of King James, which is itself framed by two banners carrying verses from 1611: one from the Old Testament, as translated by the First Oxford Company (Isaiah 49:13) and one from the New Testament, as translated by the Second Oxford Company (Revelation 19:6). For these banners I chose verses that not only resonate poetically, but that also address one of the key themes of the exhibition – the many voices of the King James Bible. 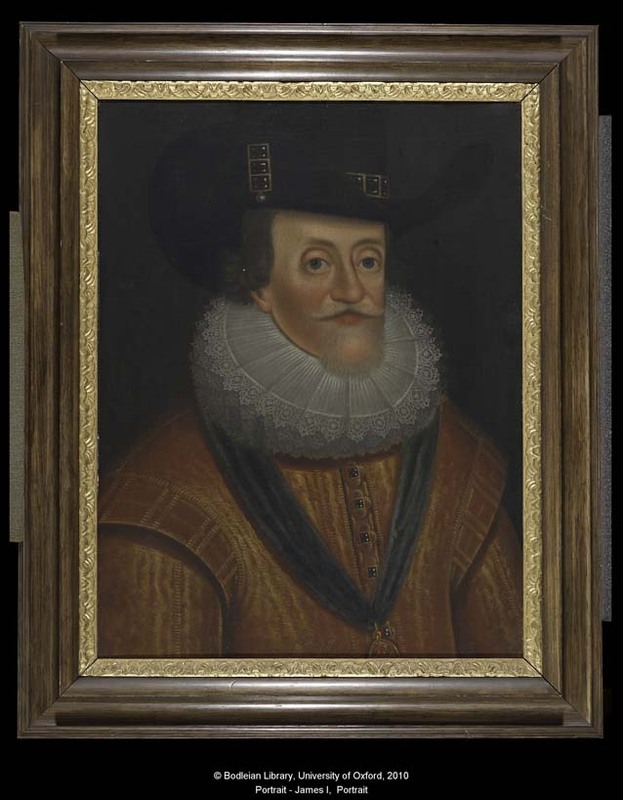 Portrait of King James I, Bodleian. Helen Moore chairs the curatorial committee of the Bodleian ‘Manifold Greatness’ exhibition. She is Fellow and Tutor in English at Corpus Christi College, Oxford. 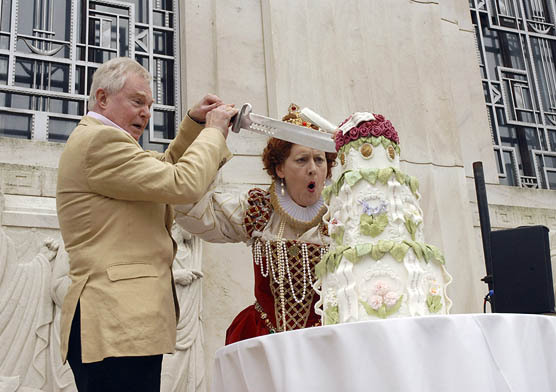 Queen Elizabeth I (Penelope Rahming) and Sir Derek Jacobi cut Shakespeare’s birthday cake at the Folger Shakespeare Library, April 2008. Claire Duggan. There is a lot of misinformation out there about the King James Bible. (See my earlier post on Shakespeare as translator.) On both sides of the Atlantic, people are celebrating today as the publication date of the KJV. Even Garrison Keiller has used the date in his Writer’s Almanac. The date even seems to have a certain venerable tradition, since the date is noted as far back as 1866 in A Reference Book for English History by Alexander Charles Ewald. It’s been in lists of famous dates ever since. The problem is that it’s not true. 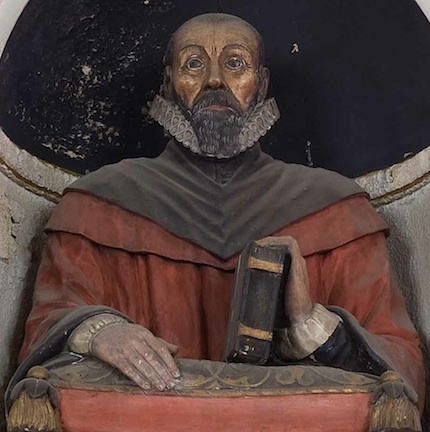 Never mind that there’s no documentary record of May 2 as a publication date — the more important point is that the whole notion of a “publication date” did not exist in 1611. Even pinning down the year of publication of books can be tricky. Some were given fake imprints with falsified dates (many 17th century Geneva Bibles, for instance). In other cases, especially with a book as huge as the Bible, printing took a rather long time, and it is not at all clear when the finished product was finally made available to the public. The one record that does help approach the time of publication is the Stationers’ Register, but there’s no record of the KJV, because it was considered a revision, not an original book. David Norton, who knows more than anyone about the text and printing of the KJV, describes it as having appeared sometime between March 1611 and February 1612 (the earlier system of dating, beginning the New Year on March 25, is a further complication). So it’s actually possible the KJV didn’t come out in 1611 at all! We are uncomfortable with uncertainty, it seems, especially anniversaries. Look at Shakespeare’s birthday (photo above!). No one knows on which day in late April he was born, for the simple reason that all we have is a baptismal record, not a birth certificate (there wasn’t such a thing). We want to celebrate Shakespeare’s birthday, though, and April 23 appeals for two reasons: he died on April 23, and we like the symmetry of matching birth and death dates; and April is St. George’s Day, patron saint of England. It doesn’t seem that May 2 has any particular associations, but we do want to a day to celebrate. Never mind if it’s the right one.